Info "Blow a bubble with your gum. Blow gently, or you'll pop it and get it all over your face!" Pop Art is a microgame found in WarioWare: Touched! in the Mic Rocking stage. The objective is to blow a bubble within the dotted circle. The bubble must be blown fairly gently; if it is blown too hard, it pops and the microgame ends in failure. The player also loses if time runs out and the bubble hasn't been blown. 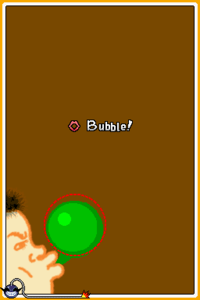 1st level difficulty: The player must blow a small and green bubble. 2nd level difficulty: The player must blow a medium-sized and white bubble. 3rd level difficulty: The player must blow a big and white bubble. This page was last edited on April 7, 2018, at 05:12.